Gifu Castle (岐阜城) is a mountain castle located in Gifu city. The mountain is also known as Mt. Kinka or Mt. Inaba. 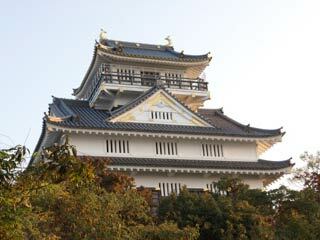 Gifu castle is very popular as the castle of Oda Nobunaga and Saito Dozan. It was built in 1201, and mainly structured by Dozan in 1539. When Nobunaga conquered this castle, his vision became clear and started using the red seal of Tenkafubu which also means he started to moving forward to unify Japan. Today, it is the symbol of Gifu city and popular spot in the area. It has great view of Gifu and Aichi, especially beautiful at night. There are several hiking courses to reach the top of the mountain where Tenshu-kaku of Gifu castle is. Also, there is a ropeway to the top of the mountain. There are several free parking around the mountain. Admission for Tenshu-kaku: 200 yen for adult, 100 yen for kids. Ropeway: one-way 600 yen, round trip 1050 yen. Gifu Castle was built in 1201 by Nikaido Yukimasa. In the middle of 15th century, Saito Toshinaga repaired this castle for himself. In 1525, Nagai Nagahiro betrayed Saito clan and attacked this castle, then Nagai clan became the lord of this castle. In 1533, Saito Dozan succeeded this castle and built Tenshu on the top of the Mt. Kinka. In 1556, Saito Dozan was killed by his son Yoshitatsu, but Yoshitatsu died in 1561, and Yoshitatsu became the lord of the castle and Mino. Nobunaga started to have a vision of the unifying Japan, and using red seal of "Tenkafubu." In 1576, Nobunaga gave the position of the lord of Oda clan and this castle to his sone Nobutada. In 1582, Nobunaga and Nobutada were killed at Honnoji. After Nobutada, this castle was ruled by Ikeda Clan, Toyotomi clan then back to Oda clan again. In 1592, Oda Nobuhide, the son of Nobutada became the lord of Gifu Castle and he was the last lord of this castle. After the battle of Sekigahara, this castle was abandoned by Tokugawa Ieyasu. It is said that on August 14, 1567, Kinoshita Tokichiro, later Hashiba Hideyoshi, infiltrated the Inabayama castle from Iwadoguchi, accompanied by only 7 men, including Hachisuka Koroku and Horio Mosuke, who were huntsmen in the mountains. They set fire on woodsheds and were greatly praised for their work. Hideyoshi loudly called out victory as he brandished a gourd tied to his spear used to kill the castle soldiers. Since then, this place is considered to be the original site of SEnnari Byotan Gourd. Nanamagaricuchi: 1900m long, 60 min. for beginners. Hyakumagariguchi: 1100m long 40 min. where Hideyoshi climbed. Umanoseguchi: 1100m long 40 min. Requires hard climbing. Very dangerous for climbing down. Mizunoteguchi: 2300m long 70 min. for beginners. Hanadakatozan route: 1500m long 40 min. Has great view. Higasizakatozan route: 1100m long 45 min.